Do you include ear training exercises in every lesson? This definitely wasn't a huge part of the traditional lessons I had as a child. Fortunately ear training has evolved quite a bit from the "Now Hear This" cassette tapes and workbook that my teacher sent me home with years ago. Group lessons are the kick-off event for my monthly themes in our studio, and we kicked off November with some Ear Training Games. There is definitely a lot more excitement and motivation that comes with ear training in a group setting! I find that sometimes as experienced musicians we assume students already possess some building block skills like audiation that we take for granted as seasoned musicians. Tim Topham's blog has several great step by step ideas for practicing ear training in private lessons. I tweaked the Scale Stops game from his blog to create a group lesson version. This game gives students the initial foundation necessary for interval identification by ear. Concept: Hearing Scale Degrees (Prep for identifying ascending intervals). How to Play: Teacher starts on the tonic note and plays up the major scale stopping on a certain degree (note) as students internally count or sing to determine what note they stopped on. Students race simultaneously to stack their cups one at a time up to the scale degree number and throw their hands in the air when they think they have the correct answer. Toss Variation: Partners stand across from each other with a bucket of bean bags at their feet and alternate rounds tossing the correct number of bags equaling the scale degree stopped on. Boost the Learning : Instead of the teacher playing samples, students take turns drawing a flashcard note within the Middle C Scale and then play the C scale stopping on that note. How to Play: Teacher plays an interval on the piano, students make motions that match the associated interval song. See more details on this post. Students won't complain about being drilled on intervals with this fun game available at Pianimation.com. To boost the learning I have the students take turns playing interval cards for the others to identify. These are available free from this pianimation.com Over the Edge game and I just pull out the ascending Major/perfect intervals neede for this game. Visit 4dPiano Teaching to get the free download of this beginner bingo style game. 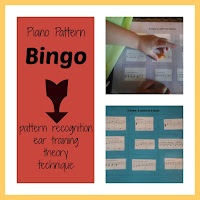 Visit Pianimation.com for a free download of this bingo style game that addresses several ear training concepts. Concept: Identifying common music patterns like chords, scales and arpeggios by ear. Students can get a lot of energy out in this game as they run to the poster that matches the quality of the chord played. Prepare cards with a happy face (Major) on one side and sad face (minor) on the other or buy some m&ms. How to Play: Play a sequence of 3 or 4 Major and minor chords. Students flip their cards to match the pattern that you played (M,m,m,M or m,m,m,M, etc.). With m&ms the printed side of the candy represents minor and the blank side Major. If they get the pattern correct they can eat an m&m (or add it to their cup if you are tallying points). "What's Missing?" and "Rhythm Tag" "Rhythm Telephone Race". See this post for details on these fun rhythm games that use Let's Play Music Rhythm Bugs.